The Quebec government has tabled its long-awaited secularism bill, laying down proposed ground rules it says will ensure the religious neutrality of the state. The preamble also notes that Quebec “attaches importance to the equality of women and men” — an apparent reference to the concern expressed by some people that the hijab, the headscarf worn by some Muslim women, and the niqab, a Muslim veil, are symbols of female inferiority. The word “laicity” — a translation of laïcité, a term rooted in the French Revolution — is used 18 times in the bill while “secularism,” the frequent English translation, isn’t used once. Laicity, according to the bill, is based on four principles: the separation of state and religions, the religious neutrality of the state, the equality of all citizens and freedom of conscience and freedom of religion. The most contentious section of the bill, if made law, would ban public workers in positions of authority from wearing religious symbols. Immigration Minister Simon Jolin-Barrette said all religious symbols — regardless of the size of the object — would be prohibited. A religious tattoo or a hairdo, such as Rastafarian dreadlocks, are not considered a religious symbol, he said. Any public employee who carries a weapon, including: police officers, courthouse constables, bodyguards, prison guards and wildlife officers. Crown prosecutors, government lawyers and judges. School principals, vice-principals and teachers. A grandfather clause would exempt some public workers as long as they hold the same job. In the case of teachers, the exemption would only apply for as long as an individual teacher exercised the same function while working for the same school board. The bill also details rules that would require citizens to uncover their faces to receive a public service for identification or security purposes. The previous Liberal government passed a law with similar requirements, but the relevant sections remain suspended following a court challenge by civil liberties groups. Municipal services, for instance, public transit. A woman who gets on a bus wearing a Muslim niqab would need to uncover her face in order to confirm her identity in order to use a discounted transit card, Jolin-Barrette said. Doctors, dentists and midwives in public institutions. 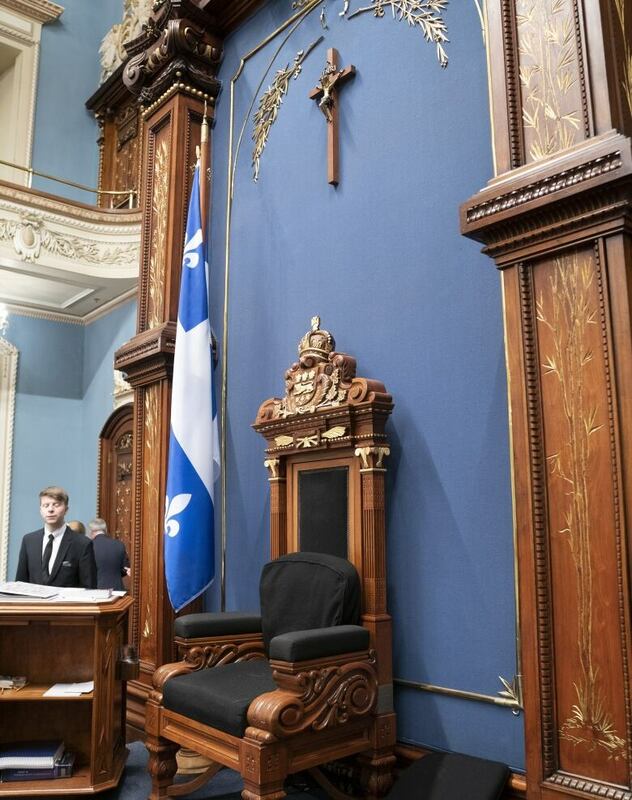 There’s no mention of the crucifix that hangs above the Speaker’s chair in the National Assembly, but the CAQ government has promised to move it to an unspecified location in the legislative building if the bill becomes law. A motion was unanimously adopted by members of the National Assembly on Thursday. The crucifix, which was installed where it now hangs in 1936, has been a sticking point as successive governments have tried to pass a secularism law. The landmark Bouchard-Taylor report into the accommodation of religious minorities recommended in 2008 that it be removed, but no government has done so. The bill invokes the notwithstanding clause to override any violations of the Charter of Rights and Freedoms. The clause allows provincial or federal authorities to override certain sections of the charter for a period of five years. It mentions, in particular, sections two and seven to 15 of the charter, which pertain to legal rights. Section two protects the “fundamental freedoms” of individuals, including freedom of conscience and religion.